Fresh vinegar has a very sharp and biting taste. Its true quality is best revealed by aging. During aging, it becomes more mellow. 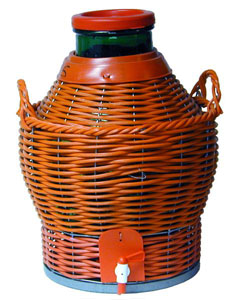 The esters and ethers of the vinegars are allowed to mature, and many of the finer qualities emerge. A minimum of six months is required for vinegar to begin to attain its highest qualities. The longer it is aged, the more these subtle qualities will developed. One of the chief causes of the deterioration of vinegar is the bacteria that make the vinegar. If left exposed to air in the absence of alcohol, these bacteria will then convert the vinegar into carbon dioxide and water. So whereas the presence of air was crucial in the acidification process, it is now, to the same degree, undesirable. The acid level will begin to fall after it has reached its peak. When the acetic acid has fallen to 2 percent or lower, other microorganisms will now begin to take over. At this point all is lost. To prevent this unfortunate turn of events, the storage container should be filled completely to the top and tightly closed with a non corrosive cover. Vinegar should be stored in a cool, 40 to 50 degrees F., dry place for at least six months. The longer the vinegar is stored, the better it will be. High temperatures tend to decompose the vinegar. 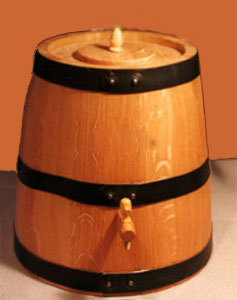 The addition of a small percentage of alcohol into vinegar that is being stored, particularly during aging, tends to improve the keeping quality of the vinegar. Flavoring vinegar is the addition of other aromas and flavors into the vinegar. This process does not involve fermentation and is much simpler than making vinegar from scratch. It is more akin to making tea. It can be a good starting point for many people. Vinegars may be flavored with many different materials. Although woods are the most common and are responsible for the great taste of the finest vinegars, various other plants may be used. It is possible to use herbs, spices, fruits or vegetables. Combinations of these may also be employed. These taste can also be changed depending on which vinegar is used. Once vinegar has been properly aged it should then be put into small containers. Pint-sized containers with long, thin necks are recommended because they are easy to handle and provide for minimum exposure to air. The small containers also allow the vinegar to be used a little at a time without exposing the larger quantity to the air. But any kind of small-necked glass or glazed ceramic container that will minimize surface exposure will work well. The most important consideration is that the containers are completely filled and tightly sealed. Waxing is highly advantageous. It you are just starting, stick to glass bottles. Some consideration to decorative bottles should be given. If they are old bottles, make sure they are sterilized before filling. This addition will make a great contribution to the presentation of your product, which tends to positively prejudice the user toward the contents. Vinegar making stills come in fancy styles like these but you could use something as simple as a stainless steel or dark glass bowl. Closer look their cute face. 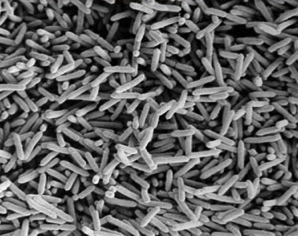 The Acetobacter aceti are the bacteria responsible for making vinegar. 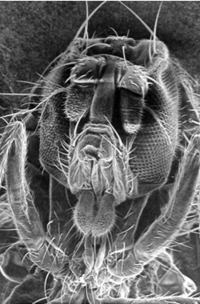 This is an electron micrograph. The bacteria are too small to see with the naked eye. They move around with a very tiny tail that they spin like a little underwater motor boat. Making vinegar is so easy it can be done by accident. We could even say that most of it is made without our cooperation or awareness. Making good vinegar consistently is quite another story. That requires a little effort. But the effort pays well. Vinegar can be made from almost anything which contains sugar or starch. It is made from many different things; fruits, grains, roots even wood. It can be made directly from sugar but is best made by first converting the sugar into alcohol and then turning the alcohol into vinegar. The conversion from starch is a little trickier, but the process shares a lot of similarities. There are many ways to make vinegar and many of them are covered in our fun easy to read reference book on the subject. But for now let's stick to the very simplest way possible. A container with a spout. The spout is not mandatory but it sure makes things easier. The container should also have a wide mouth to let in air. But you also need a way to keep out the vinegar flies keep out flies. (Air is very important!) 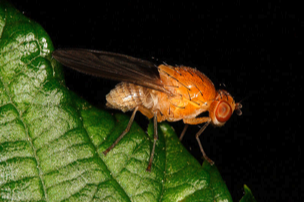 You will be visited by vinegar flies! They are my assistants. The container should be ceramic, glass or stainless steel for best results. Aluminum and iron is definitely out. Some plastics can work, some can be dangerous because they react with vinegar. So, for now, I would skip plastics. A starter culture. Notice I said "starter culture". Don't make a big deal about getting a "mother", it will probably ruin otherwise good vinegar. What you need are the Vinegar bacteria which make vinegar. You need a Vinegar culture. Check the home brew stores or pick up a bottle of unpasturized, unfiltered vinegar. I have had great success with Braggs Apple cider vinegar. The vinegar in the culture keeps out the other molds and bacteria until the vinegar bacteria have had a chance to take firm control of the juice. A dark place. You could also paint your jar or cover it . The object is to keep out the light. Light will slow the vinegar production or even kill your culture. A warm place. The precise temperature is not so critical but it does make a difference on how fast your vinegar is made. If you feel comfortable at that temperature, most likely the vinegar bacteria will be happy also. OK, we have a vinegar culture, a container to put it in, some food for it and lot's of warm air available to it. Pour about one quart of the starter into the container. ◆	Pour about the same amount of juice into the container. ◆	Put the mix into a warm dark place. ◆	Keep checking it until it is as strong as you like it or it seems to be losing strength. ◆	Bottle it in small bottles. ◆	Once you have got the hang of it, you might want to try making some real special vinegar. ◆	And Remember the Vinegar Man loves you. There are many small scale vinegar makers all over the world. Most of their methods are variations on the Orleans or Let Alone method. However, there are some unique twists as well. I will be adding some presentation of some of these unique methods by years end so check back,follow me on Twitter or join Vinegar Connoisseurs International and I will let you know when I add something on it. The overwhelming quantity of vinegar made in the world is made industrially. They are made in machines called acitators. Time is one of the most important elements in vinegar making. In large scale commercial manufacture, "time is money," so the faster they can convert the alcohol to vinegar the more money they can make. The banks look very favorably on this. Most of this vinegar is used for making industrially produced mayonnaise, mustard, catchup, pickles and so on. The majority of it is distilled, that is to say clear vinegar. I will be adding some details about this by years end so check back, follow me on Twitter or join Vinegar Connoisseurs International and I will let you know when I add something on it.